I'm it's 11th owner. so it's been about a bit. It's had the usual abuse for a newly owned car, someone even managed to roll it. How they managed that beats me, as I used to go round roundabouts doing 60 without as much as a slide. It was repaired by it's last owner with a new roof & brought back to life as a fully restored white XR4x4 2.9 EFI Seirra. Then I bought it in 1998. Over the years it's had a lot of upgrades from suspension, brakes, body & paintwork, alloys, re-trim, re-build of EFI engine & now the 24v engine. It's had numerous boot builds ( it's present one is no. 7 ) In this time I've spent nearly £30,000 on it. Why? you ask. because I've enjoyed doing the work & I don't want a car that looks like everything else in the car park. I've also had to learn a lot of new skills & be very patient as it doesn't always turn out the way it was supposed to. i would remove that dinner table on the back off the car. a: its slows you down, b: in my opinion, its makes the car ugly. but thats just me talking. if you like it this way, keep it like it is. Someone has shown me pictures of that car before I think. Did it have a funky re-trim inside? I've built it as a show car not a racer so the dinner table won't make any difference, I hate the look of the RS spoilers so I went this way instead. Thanks for the comments anyway. As far as big Alloys go, I'm happy with 17s & it's staying a 4 wheel drive. Yeah I have been shown pictures of that car before. It has some bits from me on it I think. I think I said at the time I didn't like the furry interior but the rest looks good. You have obvously spent a lot of time & money on it. Well done. Ps I like dinner tables. These are some of my previous boot builds. Build 1 was basic, build 2 was an upgrade of equipment. I will be painting this to match the colour code when done, I'm not too sure about the amp shelf yet, I might us holographic vinyl as in past builds cause it's great for bouncing the light from the U.F.O. kit which will be going back in. In the previous builds they've all had full covers over them so all you could hear from the back when covered was the bass from the subs. I don't get vibration from the body work because I've put sound deadening on everything, inside the doors, inside the quarter panels, the tyre well, the back panel & from the bulkhead to the back panel. The fuel cut off switch has been moved from the tyre well to under the back seat so the rear battery tray could be welded in. The engine is fitted with 2 Alternators, 1 for the car, 1 for the rear battery. This will power all auxilliarys such as the 2 UFO kits, the sound system, the external 12volt jump lead connection for the tow bar which I custom built through the bumper to tow my jetski if they ever get finished. The tow bar is designed to come off leaving no trace of it ever being there. An update to this has been needed for some time. Thanks to Whitestate the engine runs. The sound system is 85% complete & is so loud you can feel the concrete behind the car vibrate. The coil overs & brakes have all been refurbished but it's still up on axle stands. I'm on stop due to a back injury in work, I am physically unable to carry out the work needed to finish it at present. Which is driving me mad. Shame about your back mate, hope it's not serious! Nothing worse that having to sit about doing nothing when you could be working on the car! Back in May 2013 it was going well, parts were being refitted at the rate of knots, then I buggered my back up in work and everything stopped dead. All the cracking weather we've had over the summer I would have had it ready for Trax in September as that was my plan. But all I've been able to do is sit and look at it and it's pissed me right off. Now in November I'm still unable to touch it as I'm unable to physically do it. I'm hoping for some good luck in the coming months so I can get a local garage to finish it for me. I don't mind if I've got to stand and watch as I know every nut n bolt on this car and how I'd like it done. It might be a nice project for all ages in a garage that do it, as there's a few leaks on the engine still to do, the exhaust is made but needs to be fitted and all the interior needs to be refitted, suspension need setting up, boot lid needs rewiring and some tweeks need doing in the boot. It's all pritty easy to do if ya back aint fucked. The engine wiring needs tweeking too. But at present everything is on hold as I can't afford bus fair at the moment. Don't give up. There will be beter times. Let your back heal first as your health is far more important than a car. 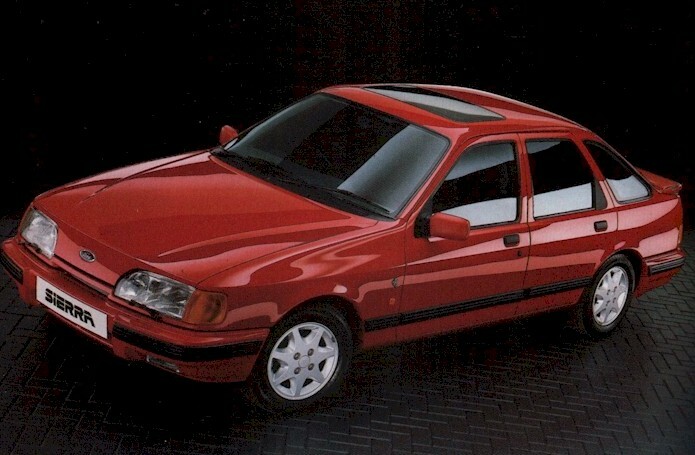 not a massive sierra fan but i do like the fact that youve gone at it and made it your own. the engine bay looks very nice,kits one ive not seen before but quite like and i even like the pimped interior. not a lover of the big rear spoiler though ,i had one on a car years ago and it used to bounce up and down on the motorway so was binned. thats just my opinion though and i like the rest so keep at it mate. not everyone likes my car either but like you, i do things the way i want too. Its a loud, obnoxious, in your face car. The sort that most people look at and think "WHAT THE HELL IS THAT"
I tell you what it is....its a brilliant piece of Ford excellence. Its a Sierra, not many left, even fewer with the time, effort and dedication that's been put into this one. So its not got a grey Recaro interior or a crap Blaupunkt stereo. Its a cool piece of personal engineering. My Sierra looks like a scumball rally entrant which takes 2 minutes just to start once I've finally climbed over the cage, I have to wear ear defenders when driving and sups fuel like it was free but I drive it everyday. If it puts a smile on your face, then its a job well done. Fairplay to you fella, nice job. An update on the monster... Finally started work on it again at the beginning of February. Got so many leaks I've taken the engine back out to get at them easier, Power steering to steering rack pipe is leaking everywhere all the time, so making up new pipe for that. The top water pipe under the injectors wasn't on properly and seal was knackered, I'd forgotten it was there cos I couldn't see it. The 2 oil return drains on the heads where leaking and they were a nightmare to get at with the engine in the car. So far had drains welded into the sump, all the pulleys are at the powder coaters, but my battery exploded in my road car, so waiting for manufactures to get back to me. just a heads up , have you put the head drains under the oil leavel and not above ? if you look at a std 24v sump the drains right down to the bottom of the sump !! They do return under oil level but its not a sealed return under oil level.the alloy plates are only tack welded on.it promotes oil to settle in sump rather than flowing out and hitting moving parts causing foaming of oil. I've struggled with these pipes as there is limited space on the right hand side of the sump to put the pipe through. I made aluminium sleeves and had them allie welded on the inside because they leaked each time the engine turned over, I know why now. Where the pipe is fitted on the right is where the oil pump is mounted so it wasn't going in, with a bit of grinding on the welding it should allow it to drain now. Considering I've never seen this engine in a Sierra before everything is guess work. Including routing the water pipes. Engines nearly ready to go back in. As everything is such a tight fit and I'm not sure if the water pipes are in the right place, I've put some heat proof wrap on the down pipes. Anyway it'll help me from burning my fingers in the future if it's not needed. I've still got to get the pipe remade for the power steering pump and tidy up my wiring in the engine bay while I have the chance. Have a new battery on order, so it may see the road this finally. With some help, the monster fired up. but still have wiring issues, not my strong point. upgrade injectors were the problem pumping too much fuel in and drowning the spark. injector connectors are knackered, so that's the next job. Thanks for the help lads. Can finally see light at the end of the tunnel.